In most parts of the world, unions are being made irrelevant. Their membership numbers are falling and their usefulness to workers is eroded. Because of increasing manpower legislation and powers conferred to citizens through tribunals and courts, there really is little reason to join unions anymore. The right to strike is becoming a primitive weapon in the 21st century. Attitudes towards workers have changed. The employer is no longer the stereotypical bully and the employee isn’t a helpless, downtrodden creature any longer. Technology has made it possible for anyone to become the boss; either of himself or for others. Unions have to evolve or face being made irrelevant. The NTUC had realised this problem years ago. Data shows that our base of workers have changed from being blue collar heavy, to PMET (Professionals, Managers, Executives, Technicians) heavy. Much of the workforce can turn to either the Ministry of Manpower and their labour tribunals for redress or manage their own matters in the civil courts. The employment landscape here is so tight, there really is little fear that a PMET cannot find a job easily after leaving one. So if these are not important factors anymore, what will be the role of our unions and of the NTUC then? 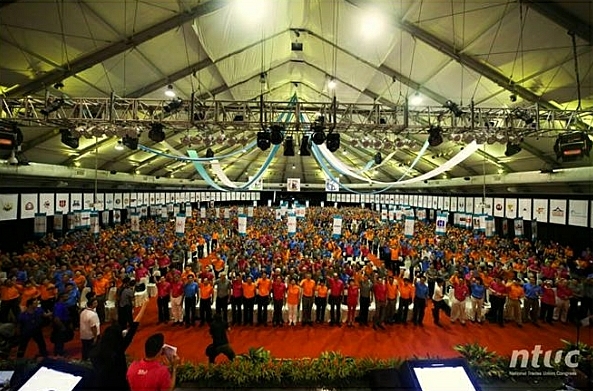 Ahead of Labour Day this year, NTUC unveiled a new direction for the labour movement: that of an Unusual Labour Movement. Explaining the unusual labour movement, National Trades Union Congress (NTUC) Secretary-General Chan Chun Sing says in most parts of the world, unions are seen as an anachronism of the past. Unionisation rates amongst workers in these countries have progressively declined as workers simply cannot find any reason to join them. “This has resulted in many unions across the world, locked in an internecine fight over a shrinking pie with either their respective governments or companies, if not both. We, on the other hand, have been fortunate that our unionisation rate has continued to grow,” he said, adding that this has been possible because of Singapore’s unique model of tripartism – where unions work together with the government and employers towards better outcomes for our workers. The programs and partnerships developed by the Congress is delivered with these in mind. To add positively to your employability makes more sense than being obsessed with negative activities such as strikes and bargaining. This is not to say that our unions will no longer be engaged in collective bargaining and fighting for fairness. They will still be, except that their repertoire of services has expanded. How are our companies going to respond? How will workers take advantage of these programs? We shall explore these in upcoming articles and interviews with much curiosity.